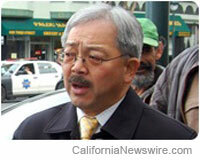 SAN FRANCISCO, Calif. /California Newswire/ — On Tuesday, S.F. Mayor Edwin M. Lee and HBO announced the signing of a lease for stage and production office space for HBO’s upcoming new series “Looking,” which began filming this week in San Francisco. The lease in the Mission neighborhood creates local jobs that include cast and crew, with a citywide estimated $2 million in economic impact between now and November. “Looking” will follow three gay men in San Francisco. It stars Frankie J. Alvarez, Murray Bartlett and Jonathan Groff in the lead roles. The series is created by Michael Lannan and will be executive produced by Andrew Haigh and Sarah Condon. HBO begins filming the first season in September and will complete in November. The San Francisco Board of Supervisors unanimously passed an amendment to the Scene in San Francisco Rebate Program that allows the San Francisco Film Commission and the Department of Real Estate to lease non-City-owned property to film production companies for film-related activities. The amended legislation offers rebates under the City’s film incentive through rent credits. Prior to this amendment, rebates were only available to film and production companies for leasing City-owned property; which made it challenging given the limitations with available property. In April, HBO filmed the show’s pilot in San Francisco, where more than 100 residents in San Francisco were part of the cast and crew. HBO has also filmed Philip Kaufman’s Hemingway & Gellhorn in San Francisco in early 2011, employing more than 100 locals with a $6 million economic impact to the City.